The Lúculo was dark, handsome and spicy. White pepper and plum skin. No fat. Old-skool. If any of this wine sees new oak, it certainly isn’t bearing any negative aspects of it and is quite integrated. 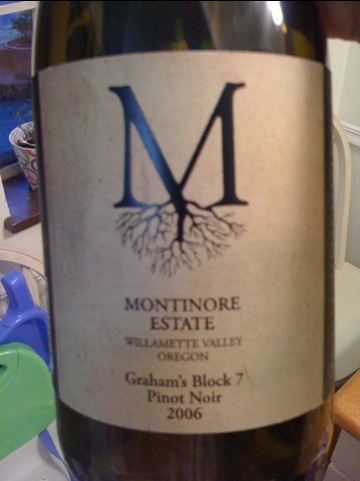 Dried herbs and relatively firm tannins. 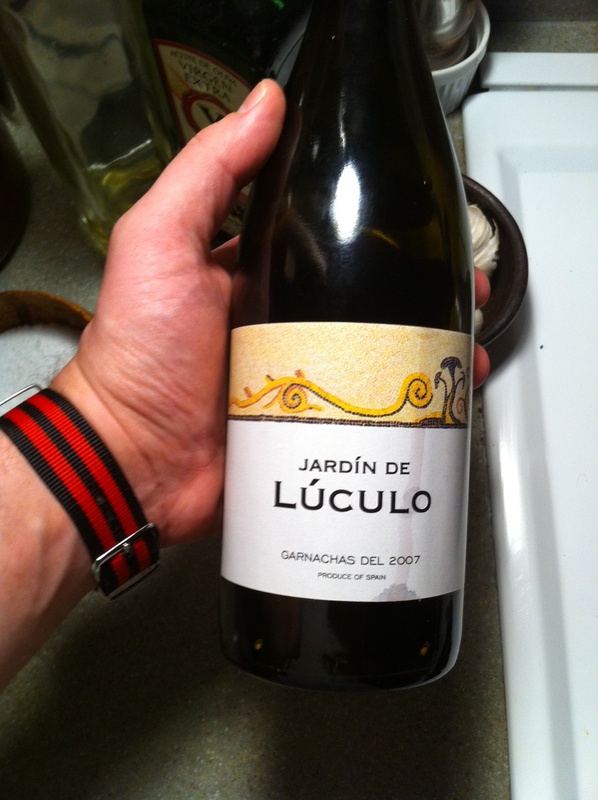 Definitely a cooler-climate style than the typical cheap Spanish-gluggable-Garnacha. 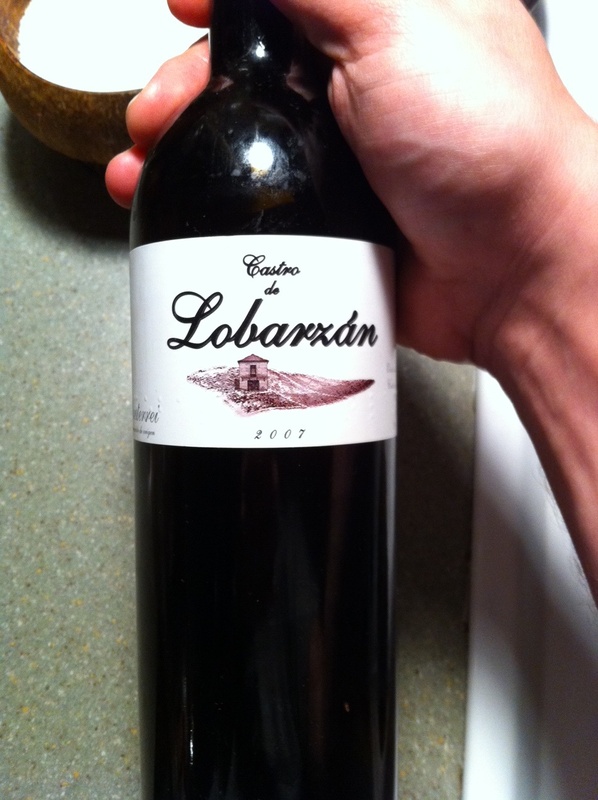 The Lobarzan (Mostly Mencia with a minority percentage local Tempranillo clone) was perfectly leafy and red-berried. It wouldn’t have been totally out of place in a Touraine rouge tasting with a great tension between the earthy-savory and fresh sweetness. It developed and fame into focus with some air. A big winner and I wish more could be on hand (Jose Pastor is no longer bringing this in, methinks). The Jimenez-Landi was exceptionally lusty. In a great way. It held up the 2nd day very well with a sweet pepperiness. 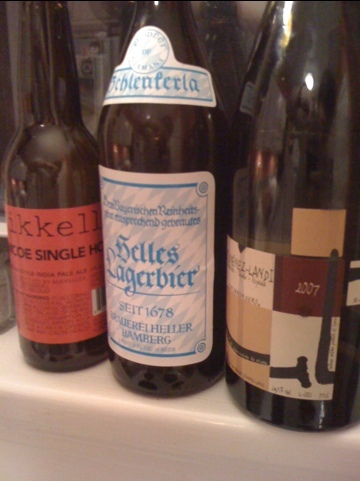 The Schlenkerla Helles Lager is just perfect. I want jugs of the stuff around. The Mikkeller Simcoe was solid and expressively grapefruity, but I’m personally not a fan of the style. Way good. Pure, balanced, 13.5%abv and flat out delicious. Underrated. 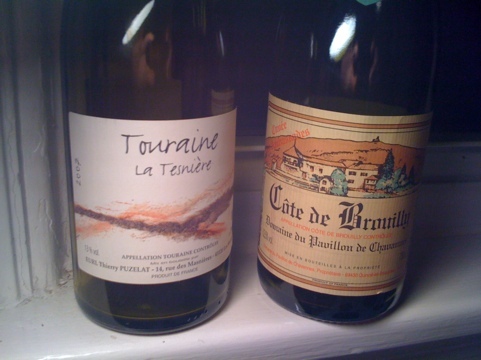 Lighter than expected from Pic St. Loup – but in a good, almost Beaujolais-like way. Carbonic and fruity and gluggable. Solid weekday value. I haven’t had a US Pinot for years. This worked. Enough funk and acid to keep it overblown. Fairly elegant but a bit darker-toned. Separated at birth. Both so lean and mineral – with the Keller skewing slightly more tropical and peachy and the Arnot-Roberts Chard going into green apple territory. The length on the Chardonnay was really something. These guys are doing fantastic things in Califonria. 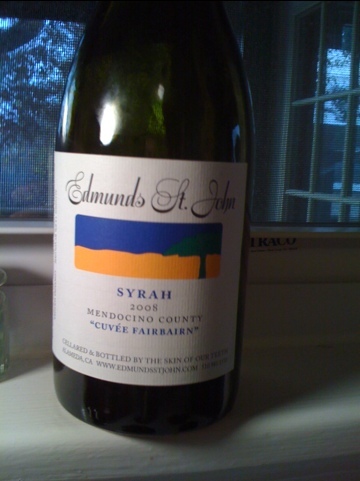 Edmunds St. Johns is quickly becoming my go-to American winery. His latest Syrah comes from a young Biodynamic vineyard in Mendocino County and accomplishes a beautiful balance of fruit and savory qualities. It’s a fresh, clean wine with blue fruit — but there is a lusty, sweaty and smokey dimension lurking beyond. The smoke and peaty iodine-like minerality immediately made me think of Ardbeg – which for me, is a good thing – but could definitely be polarizing. 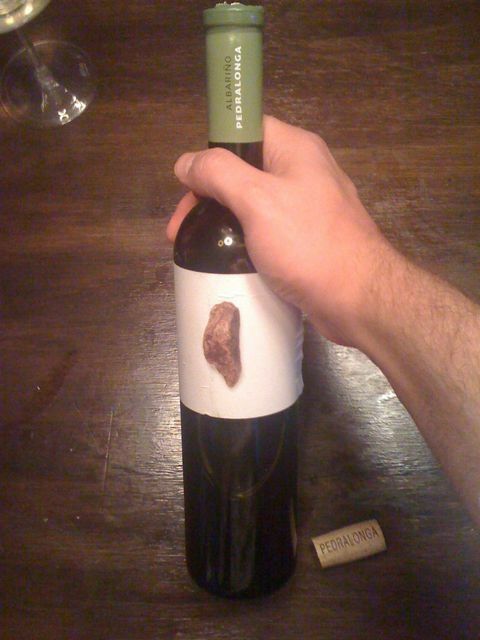 This wine felt particularly alive and ‘of the earth’ vs just ‘earthy’ or ‘dirty’. 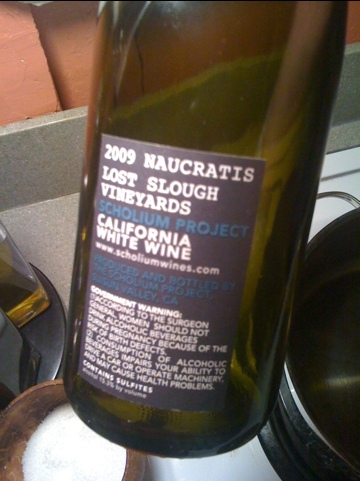 Syrah in California can so easily be blown to smithereens with alcohol, or totally obscured by wood (or both) – but ESJs wines really showcase the other side of the coin – picking at the perfect time and not screwing around with the juice yields an honest and ‘real’ varietal that belongs on the table. The Syrah that Syrah was meant to be. After a little blogcation, I’m back. 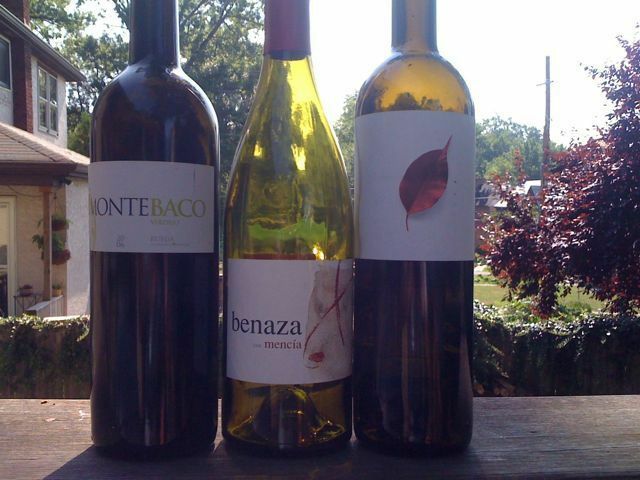 I’ve had a handful of really memorable wines including some great Faury St Joseph rouge and Blanc, the 2009 Lapierre Raisins Gaulois, another great bottle of Chateau Musar Blanc, and the wines below. The Scholium were particularly noteworthy – I’ve not tried his wines in the past and am enamored with their power and scale. Yes – the are big and yes, they have lots of alcohol – but they also have great purity, freshness and an unobscured communication of soil. The Tesniere Blanc is off the charts with bright acidity, slightly flor-ish funky with some fresh apricot. The Gahier was cranberry joy and mind-bendingly pure. 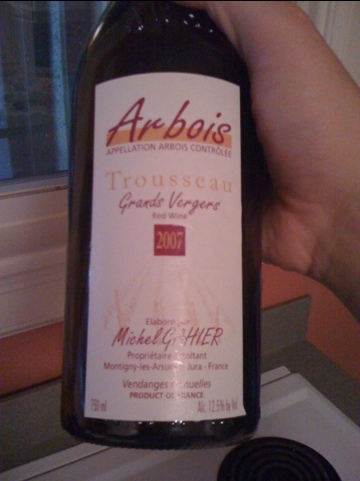 I need to explore more Trousseau. Vivid, crystal clean, pure, vibrant and a beautiful 13% ABV. This is benchmark stuff. 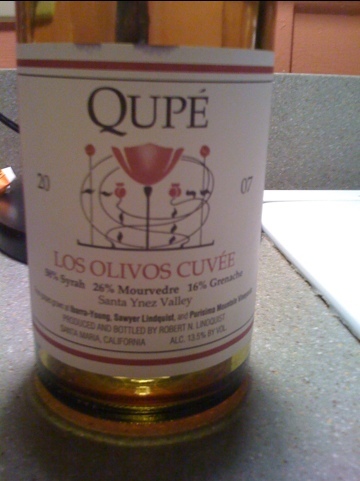 If I made wines in the Languedoc, drinking this would drive me crazy. It moves effortlessly from sweet red berry fruit – to lavender and thyme and finishes with the unmistakable communication of schiste. Light on its feet, a wine with agility. 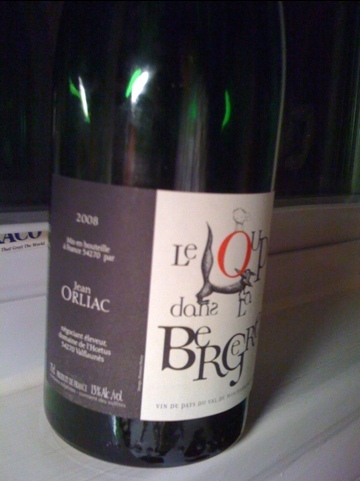 Like the Chateau Musar that beguiled me – this is a blend, but there is such a unity one-thing-ness at play here. Analysis is moot here – this is made to be enjoyed, and enjoyed it was with short-ribs and boiled potatoes. Just stunned by the diversity northern Spain has to offer.